A classic suburban landmark thanks to its location bang on the highway, Oberoi Mall in Goregaon East, in our opinion, is pretty perfect. Not a massive mall, it has all the stores that are likely to take care of all your needs. One straight quadrangle, it possible to see every store from a corner so you don’t have to go running pillar to post wasting time. Here are five recent places that have upgraded the mall for the regular patrons. People’s favourite Farzi Café is now a part of Oberoi Mall’s food options. Dig right into their forever favourites Ratatouille Gujia, Imli Sweet Chilli or Mushroom Falafel Donner for the vegetarians, and Mutton Masala Lukhmi, or Guntur Chilli Chicken for the carnivores. When we saw the man-sized teddy sitting inside the phone booth near the food court, we couldn’t keep calm that Hamley’s finally come to Goregaon East. A big-ish store with their entire range, we know where we’re indulging next. And while you’re here, we recommend checking out these five things from here. Pamper your nails at Nail Spa da Favola, a neat gallery store on the ground floor in Oberoi Mall that looks intriguing thanks to the neatly arranged colourful nail paint bottles. Be it gel nail paint, nail extensions, meticulous nail art, manicure, pedicure or nail treatments, they have it all. Book an appointment and pamper the most hardworking soldiers of your body – your hands and your feet. The orange banner with brass letters reading The Bombay Store has come to Oberoi mall too. Unlike most of their other outlets, they have a limited space here but there’s no compromise on the collection. 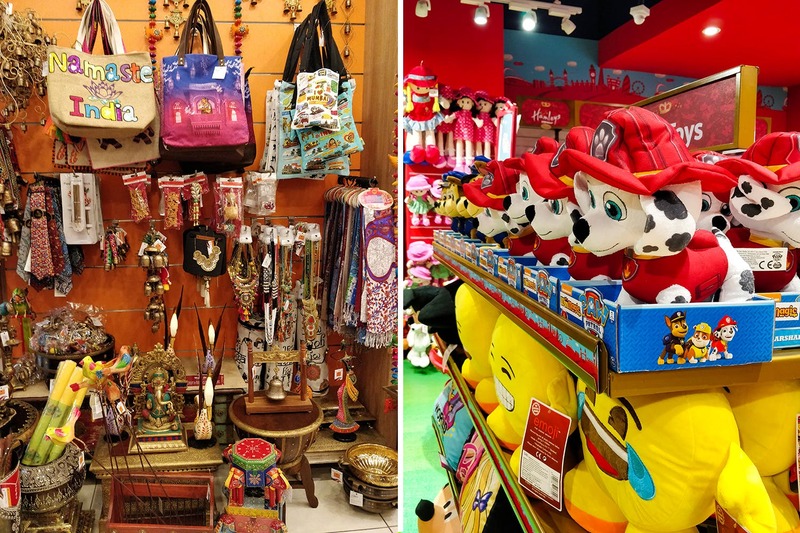 From an extensive range of brassware to different types of lamps, to Indian souvenir pieces, this store is especially great if you’re looking to buy something for your foreigner folks. The erstwhile regular PVR also got a makeover recently and turned into PVR Icon – a more spacious, better looking and enhanced movie experience. They now also have PVR [XL] which has a bigger screen and seats. And also another screen tagged Play House, which is a colourful set up perfect for the kids. Oberoi mall also has its usual suspects – The Central and Lifestyle that house multiple brands under one roof and is sure to give you ample shopping choices.